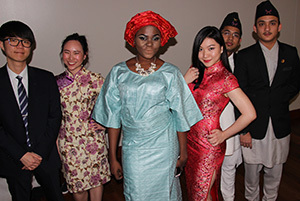 Pictured during the 2016 Upper Iowa University Spring Cultural Night were students (l-r) Hyeong Joon Song of South Korea, Ee Vonne Choong of Malaysia, Oyinkansola Oduniyi of Nigeria, E Jinq Heng of Malaysia, Arrenn Baral of Nepal and Swarnim Pradh of Nepal. The University will further celebrate the benefits of international education and exchange programs worldwide during International Education Week November 14-18. Upper Iowa University’s Center for International Education (CIE) is gearing up for a celebration of culture as part of International Education Week Monday, November 14 – Friday, November 18. International Education Week is an opportunity to celebrate the benefits of international education and exchange programs worldwide. A joint initiative of the U.S. Department of State and the U.S. Department of Education, the annual event promotes programs that attract future leaders from the United States and abroad to study, learn and exchange experiences. Daily – A different international student will teach simple phrases from their native language, as well as briefly discuss their culture from noon – 1 p.m. each day in the Student Center Hub. Monday, November 14 – CIE welcome reception from 4 – 5 p.m. in Student Center second floor lobby; appetizers and refreshments will be served. UIU World Cup Soccer Tournament begins at 6 p.m. in Rec Center. Tuesday, November 15 – Fullbright Grant (studying, researching or teaching abroad) discussion for students from 11 – 11:30 a.m. and for faculty from 11:30 a.m. – noon in Andres Center for Business and Education Room 101. Education Abroad 101 begins at 3 p.m. in Leadership Conference Room. International Trivia begins at 6 p.m. in Student Center Ballrooms. Wednesday, November 16 – International panel discusses their cultural experiences beginning at 6 p.m. in Student Center Ballroom A.
Thursday, November 17 (International Dress Day) – International Fair from 11 a.m. – 1 p.m. in Student Center Ballroom. International documentary and discussion beginning at 7 p.m. in Student Center Ballroom A.
Friday, November 18 – International sport tutorial in cricket and lacrosse from 6 – 8 p.m. in Rec Center. The UIU Center for International Education is responsible for all initiatives related to internationalizing the Fayette Campus. The CIE assists with international admissions, international student and scholar services, education abroad, intensive English programming, and the UIU-Malaysia and UIU-Hong Kong centers.